After which they thundered down the hallway to jump on the bed and act wild. You’d think I had small children up there bouncing on the bed, instead of a full grown (and I might mention older dog) upside down on the comforter, scratching his back as he wiggles all over. Each time I vacuum the bedroom, I also vacuum the comforter to get the dog hair off. The boys also like the water in the bottom of the shower. For some reason it tastes much better than what’s in their water dish! The next time I bathe the beagle, I’m running the shower water first, then letting him upstairs to lap it up. Hopefully he won’t notice me in the shower with him until the door is closed and it’s late for him to run out. Word for tomorrow – SOMETIMES. If you prefer to work ahead, see the list for the week under “A Word A Day”. 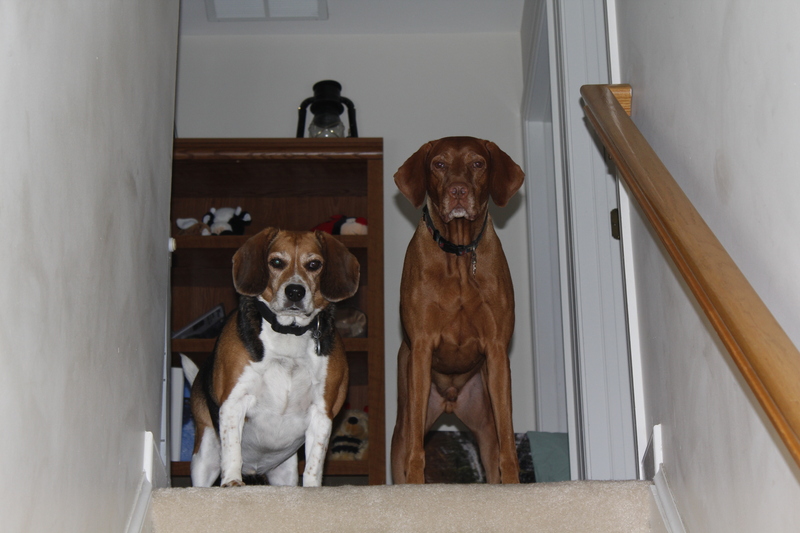 They are handsome boys.� We got leather couches a few years back to make it easier for cleaning up dog hair and body functions.� I didn’t think the boys would go up there, but they do.� I have to kick them off if I want to sit there! Your dogs are precious, love their posture & expression. They were actually two fairly wild boys at that moment.� I was surprised they stayed still long enough to get that picture!